President Barack Obama (CC'83), the first Columbia graduate to be elected president of the United States, was sworn in for a second term. He joins other illustrious Columbians who have led the country at pivotal times during its history: Theodore Roosevelt, president from 1901 to 1908, and his cousin Franklin D. Roosevelt, who served from 1933 to 1945. Both attended Columbia Law School but did not graduate. Alexander Hamilton, whose studies at Kings College were interrupted by the Revolutionary War, and John Jay (Kings College 1764) co-wrote The Federalist Papers with James Madison, essays that are considered the defining discourse on American government. Dwight D. Eisenhower was Columbia's president in 1952 when he was elected as the nation's 34th president. Obama joins a long tradition of Columbians in public service, ranging from signers of the Declaration of Independence to Cabinet members to Supreme Court justices, as well as 15 New York City mayors and 13 governors of New York. "Four years ago, we watched President Obama's inaugural address with great pride as he became not only the first African American, but the first Columbia graduate to hold the nation's highest office," said President Lee Bollinger. "This second inaugural arrives at a moment when the country's challenges remain large and the shortcomings of our national politics to address them have become more glaring. As citizens, our hope for the president and the nation is that the second term is defined by his successful leadership and by securing long-term solutions." Obama most recently returned to Morningside Heights in May 2012, when he was the speaker at the Barnard College commencement. During the 2008 campaign, he and Sen. John McCain attended the ServiceNation Presidential Forum on campus before a packed audience in Lerner Hall. A crowd of some 7,500 sat on the steps of Low Library watching the event on a Jumbotron as Obama discussed his hopes for a nation guided by civic engagement. "We have always balanced the tradition of individual responsibility and self-reliance with notions of community and love for country," he said. This year's inauguration ceremony will take place on Martin Luther King, Jr. Day, and the president has asked Americans to honor King's legacy by participating in a National Day of Service initiative. The tradition started at Obama's first inauguration four years ago, when he asked Americans to spend time on King's birthday doing service work in communities across the country. "I wanted service to be a big part of my inauguration because it's played a huge role in my life," Obama told supporters. 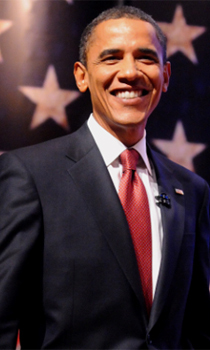 Obama attended Columbia College from 1981 to 1983, after transferring in his junior year from Occidental College. In October 2008, when he still on was campaigning for the presidency, Obama sent a letter on the occasion of the Class of 1983's 25th reunion: "I learned a lot at Columbia, found my focus, studied and came out with a determination to do something about the injustices I had seen and read about," he wrote. "We left Columbia with the wind at our backs. But in spite of our successes, many in our nation have not shared in the prosperity of the last quarter-century, and some are worse off than before. We must continually be reminded of the work that remains to protect our union and repair our world."